二进制流：字节流, 8-bit bytes; InputStream, OutputStream. 文本流：字符流, 16-bit characters; Reader, Writer. The class hierarchies for readers and writers in java.io. Subclasses of Reader and Writer implement specialized streams and are divided into two categories: those that read from or write to data sinks (shaded) and those that perform some sort of processing (unshaded). The class hierarchies for inputstreams and outputstreams in java.io. 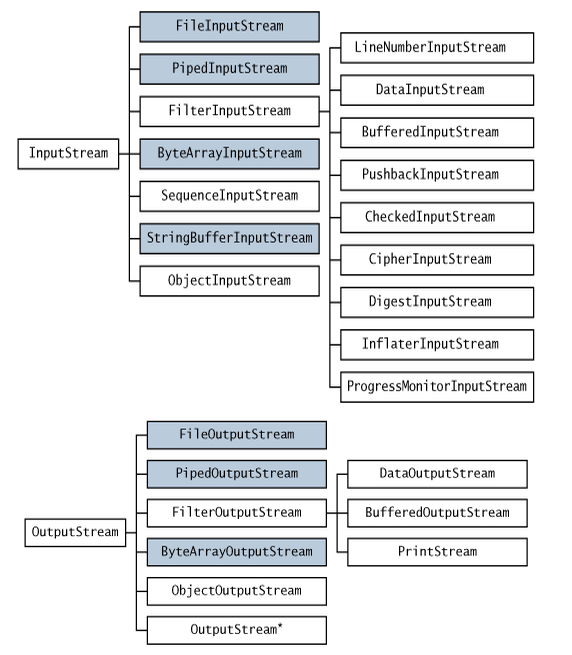 Subclasses of Inputstream and OutputStream implement specialized streams and are divided into two categories: those that read from or write to data sinks (shaded) and those that perform some sort of processing (unshaded). LineNumberInputStream is deprecated; use LineNumberReader instead. 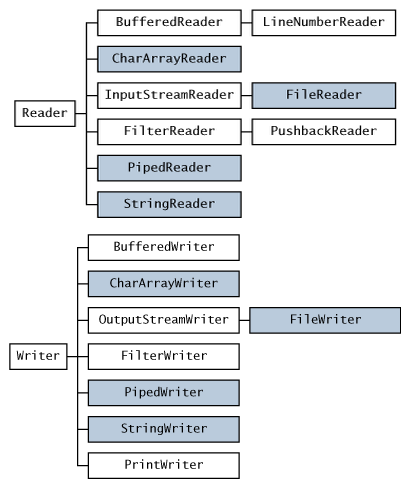 Character streams are often “wrappers” for byte streams. 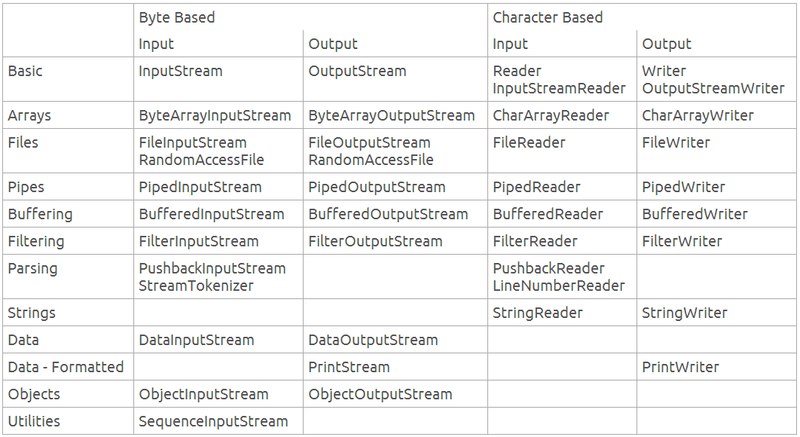 The character stream uses the byte stream to perform the physical I/O, while the character stream handles translation between characters and bytes. FileReader, for example, uses FileInputStream, while FileWriter uses FileOutputStream. There are two general-purpose byte-to-character “bridge” streams: InputStreamReader and OutputStreamWriter. Use them to create character streams when there are no prepackaged character stream classes that meet your needs. What are you talking to (n). The way you are talking to it (m). Java filter streams (decorators) are added dynamically to create the functionality needed.